Which machine can make high-quality sand? Sand are widely used in many applications such as construction, highway, railroad, and water conservancy, etc. In china, the need of sand is over 10 billion tons and the total value of sand industry is more than 500 billion Yuan. However, with many years’ exploration, natural sand are in short supply; and traditional equipment are making mechanism sand, but the simple crushing and screening, are not able to make high-quality sand, let alone the wastewater treatment. Therefore, to meet the requirement of wide market and to make up the disadvantages of the traditional technology , Liming Heavy Industry launch a modern sand making system with dry technique and tower type fully enclosed structure, named VU aggregate optimization system. This optimization system adopts cutting-edge technologies from domestic and abroad, and provides a brand new dry sand-making solution to the problem of existing sand-making industry, fundamentally solved the problem of wastewater treatment. What’s more, LIMING VU aggregate optimization system will bring a new developmental and environmental way for sand-making, cement-making, dry blend and ready-mixed concrete making industry. 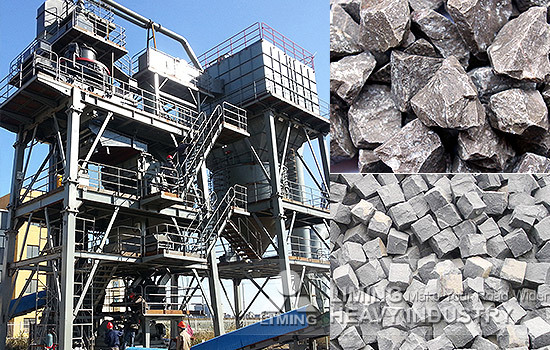 The raw materials of VU optimization system are cheap and easy to get, tailing, aggregate chips, small pebbles, even construction waste are ideal choice. The final products are of high-quality, reasonable distribution, controllable sand powder content, as well as dry clean, can undertake unity recycled high value-added powder, and meet enormous demand of aggregate market. With the enormous value of investment and environmental friendly features, the VU optimization system has been approved and welcomed by many customers. You can click here to get further information.